This is good news. On the heels of its series premiere last week, Variety reports NBC has picked up new series This Is Us for a full season. From Dan Fogelman, the drama follows a group of seemingly unconnected people who happen to share the same birthday. 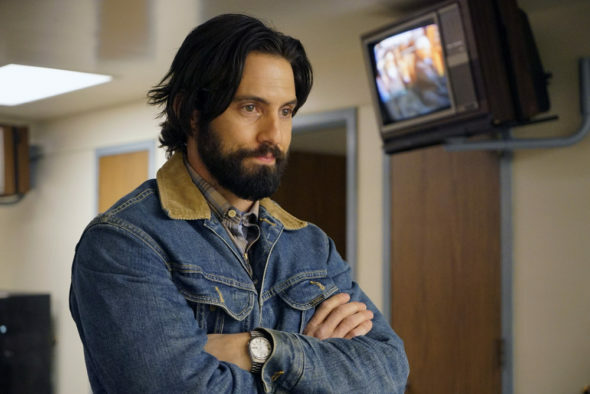 The cast includes Milo Ventimiglia, Mandy Moore, Sterling K. Brown, Chrissy Metz, Justin Hartley, Susan Kelechi Watson, Chris Sullivan, and Ron Cephas Jones. NBC has ordered 18 episodes for season one of This Is Us. What do you think? Did you see the premiere of This Is Us? Will you watch the rest of season one? More about: NBC TV shows: canceled or renewed?, This Is Us, This Is Us: canceled or renewed? Bring on season 2! Can’t wait! Best show I’ve seen in a LONG time! LOVE – LOVE – LOVE, this show was recommended to me, I have since done the same and every single person who I tell LOVES the show as much as me, at the end of every show I say it again, this show is so damn good. Love the writing and the acting. Looking forward to many, many (many), more seasons. Just watched the last episode of the season. (DVR) I TRULY love the show and I hope I get the chance to see many more seasons. PS: This is the first time I have given my opinion on any other show and I second all previous comments. Love this show. It is wonderful!!! Love this show. Very moving. Full of real life drama. Can so relate. Looking forward to season 2. LOVE LOVE LOVE This show!!! Look forward to watch every single week! Got coworkers into watching it and we are all hooked!!! Really do hope we get to enjoy a 2nd season plus more!! I was hooked from the first episode! Love Justin Hartley, and will miss him terribly on Y&R, I can’t imagine them finding a better Adam. But it’s good to see him flourish, he’s a wonderful actor. Phenomenal! Wonderful writing. Hooked from the very first episode. Watched this show for Justin Hartley who was on my favorite soap. Soon loved this new show and all the actors. It’s different with a mix of humor and drama. Currently best show on tv. Well-written, well-acted, and captivating. Please keep on the air for awhile. What a fabulous show. Actors and story lines are fantastic. It’s about time that a wholesome TV program is being aired. OH MY, THE GREATEST SHOW EVER! The Story, Writing, Actors, Acting, Costumes and the Set need I say more. Finally a show you can enjoy without muting or recording so you can fast forward so you don’t subject your family to the horror of violence or continued bad language. Discussed every week at the office. Simply the Best! According to Deadline.com, a reason for the “full-season” order for full-season order for “This is Us” being at only 18 episodes is because its creator, Dan Fogelman, has designed it to have shorter, cable-style seasons. It was said that he was initially shooting for a 16-episode freshman season, with the number eventually adjusted to 18. Second-shortest full-season order in U.S. broadcast TV history behind the 15 episodes for “How to Get Away with Murder” on ABC a couple years back? Apparently, “This is Us” will be one of those “short-seasons-only” series for the U.S. broadcast nets. Brilliant decision. This show just got that successful air about it. Sensed it in the clips, and pilot was no joke. Believe NBC got an Emmy winner here if not for story/writing the perfect casting also. Bring it on for many seasons!!!!! Great actor choices. I might’ve bn stoned when thot of that. Seems also that I’m watching 5 mins of show then 10 of commercials. C’mon guys. I know that’s how you get paid but….